New Delhi, 19 July 2017: In a section of media today it was reported that the Government servants cannot be elected to the National Sports Federations (NSFs). Minister of State (IC) for Youth Affairs & Sports Shri Vijay Goel clarified in a statement issued to the media that the present Sports Code allows Government officers to hold posts in any sports body only for one term. There is no such provision to debar Ministers in the existing Code. The age limit of 70 years for President, Secretary and Treasurer of NSF and tenure limit of 12 years is also there in the existing Code. Shri Goel further informed that the Committee, constituted by the Government, to recommend changes to the Sports Code has submitted its report to the Government. The same has also been submitted by the Government to Delhi High Court. So far, the Government has not made consultation with the stakeholders and no decision on the recommendation has been taken yet. On the basis of stay granted by the High Court of Delhi, the proceedings of the Justice Mahajan were kept in abeyance and no report of the said Committee was submitted to the Government. Shri Vijay Goel also informed that the Supreme Court has appointed the Committee headed by former CJI Justice (Retd.) R.M. Lodha which has submitted its report to the Supreme Court. The judgement of the Supreme Court in the matter is to be implemented by BCCI with regard to its structure, functioning, voting rights, tenure limits of office bearers etc. This Ministry has no role in the matter as it has not received any directions from the Supreme Court or any other Court with regard to BCCI. 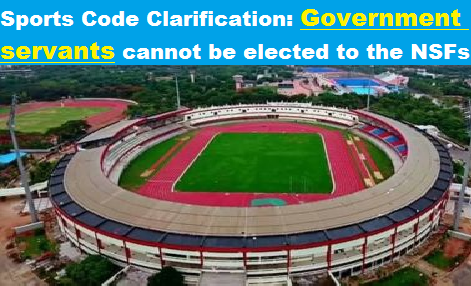 Sports Code Clarification: Government servants cannot be elected to the National Sports Federations (NSFs), Shri Goel further informed that the Committee, constituted by the Government, to recommend changes to the Sports Code has submitted its report to the Government.